Employment in foreign majority-owned Canadian affiliates totalled 1.9 million in 2013, representing 12.3% of all jobs in Canada. Ontario had the largest share of foreign-controlled employment, accounting for nearly half (or 904,000) of all such jobs in Canada, followed by Quebec at 310,800. In Ontario, foreign-controlled jobs represented 15.5% of all employment in 2013, compared with a share of 8.9% in Quebec. Alberta had the second largest share at 14.0%, with 278,800 jobs at foreign-controlled firms. Canada's overall employment grew 4.6% from 2010 to 2013, led by employment at foreign-controlled firms. Employment in these firms rose 8.8% over the period, more than double the 4.1% increase reported by Canadian-controlled firms. 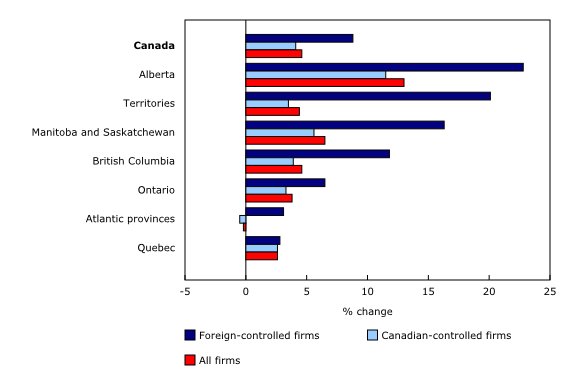 Employment growth at foreign-controlled companies outpaced that of Canadian-controlled companies for all regions of the country. The most notable employment gains in foreign-controlled firms were recorded in Alberta, the territories and the Manitoba–Saskatchewan region. In Alberta, these jobs grew twice as fast as those controlled by domestic firms. The Atlantic region was the only region to show a decline in jobs at Canadian-controlled firms but an increase in jobs at foreign-controlled firms. In Ontario, growth in employment under foreign control (+6.5%) also outpaced that of employment under Canadian control (+3.3%). Employment growth at foreign-controlled firms in Quebec (+2.8%) was the lowest across the regions, but slightly exceeded the gains at Canadian-controlled firms (+2.6%) in the province. The manufacturing and retail sectors comprised the bulk of employment under foreign control in the country, accounting for 45.3% of all jobs at foreign majority-owned affiliates. On a regional basis, 46.0% of all jobs at foreign-controlled firms in Ontario were in the manufacturing and retail sectors. This share was higher in Quebec (51.6%), and lower in British Columbia (41.9%) and Alberta (35.7%). Foreign-controlled manufacturing firms in Ontario accounted for more than one-third (or 246,300 jobs) of all employment in this sector, led by transportation equipment, food and chemical manufacturing. In the retail trade sector, approximately one-quarter of the jobs were under foreign control. In Quebec, manufacturing also recorded the highest share of employment under foreign control (104,500 jobs) within the province, followed by the retail sector, at 56,000 jobs. However, the ratio of foreign-controlled employment to total employment in both of these sectors was lower in Quebec than in Ontario. 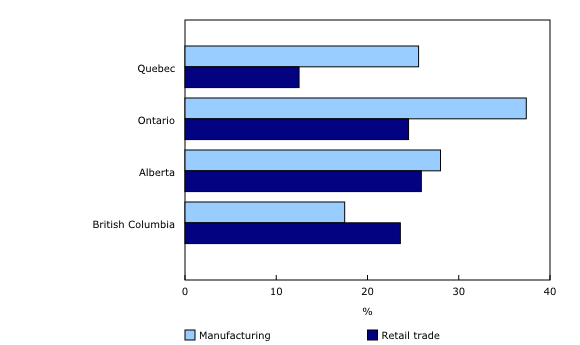 For the manufacturing sector, 25.6% of the jobs were under foreign control in Quebec, compared with 12.5% for retail. Within the manufacturing sector, the transportation equipment and the primary metal manufacturing subsectors had the largest shares of jobs under foreign control. The mining, quarrying, and oil and gas extraction sector had the highest percentage of foreign majority-owned affiliates employment in Canada, followed by the manufacturing and wholesale sectors. It recorded the strongest employment growth among all sectors from 2010 to 2013. Employment in foreign-controlled mining, quarrying, and oil and gas extraction firms was up 42.9% in Canada during the period, a gain of 21,000 jobs. Nearly two-thirds of this increase was in Alberta, resulting in a gain of 56.1% from 2010 to 2013. At the same time, jobs under Canadian control in this sector were up in Alberta by 10.2%. By comparison, employment under foreign control was up 6.8% in manufacturing and up 8.1% in retail over that same period in Alberta. Foreign majority-owned affiliates accounted for 202,800 jobs in British Columbia in 2013, led by the retail, manufacturing, and accommodation and food services sectors. Within the manufacturing sector, food manufacturing recorded the highest number of foreign-controlled jobs, although these accounted for only 16.3% of employment in this subsector. On the other hand, nearly half of the jobs in the beverage and tobacco product manufacturing subsector were under foreign control in 2013. Foreign majority-owned affiliates in the transportation equipment manufacturing subsector as well as the oil and gas extraction subsector more than doubled their employment in British Columbia from 2010 to 2013. In Manitoba and Saskatchewan combined, there were 95,500 jobs at foreign majority-owned affiliates in 2013. On a sector basis, retail, manufacturing and wholesale trade recorded the highest levels of employment under foreign control. Employment at foreign-controlled mining, quarrying, and oil and gas extraction firms rose 2,300 from 2010 to 2013. There were 96,000 jobs in foreign majority-owned affiliates in the Atlantic provinces in 2013, a gain of 2,900 from 2010. The administrative and support, waste management and remediation services, and finance and insurance sectors accounted for 59.3% of this increase. Foreign majority-owned Canadian affiliates (FMOCAs) were identified using data on foreign direct investment in Canada and are defined as Canadian entities where a foreign direct investor owns more than 50% of the voting shares. Users should note that FMOCAs do include firms that are also engaged in Canadian direct investment abroad. In this release, foreign majority-owned affiliates are referred to as foreign-controlled firms; all other companies are referred to as Canadian-controlled firms. Employment data in this release are based on establishment-level information, which better reflects the employment allocated to production and conforms to the way data are collected and presented by the source program. The industry of an establishment may not be the same as the industry of the enterprise to which it belongs. The industry-based employment aggregates are measured at the establishment level (CANSIM table 376-0153) and at the enterprise level (CANSIM table 376-0151); these two different types of aggregates cannot be compared and cross analysis between them should not be conducted. Concepts and methodology relating to inward foreign affiliate statistics can be found at Activities of foreign majority-owned affiliates in Canada. Statistics on activities of foreign majority-owned affiliates in Canada, published on December 2, 2015 (CANSIM tables 376-0151 and 376-0152), were updated to include the latest financial data available for the 2013 reference year. These statistics, available at the national level only, are generated from enterprise-based data. To enquire about the concepts, methods and data quality of this release, contact Angela Yuan-Wu (613-240-2871; angela.yuanwu@canada.ca) or Adam Gadawski (613-698-5897; adammcdowell.gadawski@canada.ca), International Accounts and Trade Division.